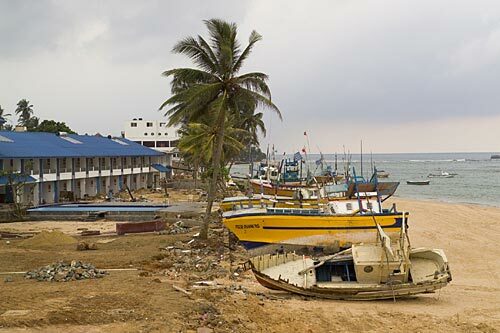 Nature Bounces Back on Sri Lanka's Coast In a series of reports for Radio Expeditions, Elizabeth Arnold journeys to Sri Lanka with one of the first teams to assess the environmental aftermath of the deadly Indian Ocean tsunami. 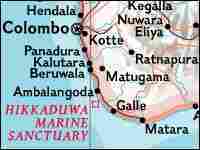 Sri Lanka's southernmost nature preserves proved to be remarkably resilient amid damage the Dec. 26 tsunami wrought on habitated areas. 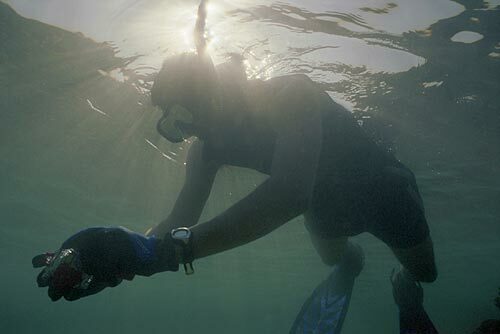 Sanjayan Muthulingam, a lead scientist with The Nature Conservancy, swims in very limited visibility debris-filled post-tsunami waters to investigate damage to coral reef ecosystems in coastal areas near Galle, Sri Lanka. 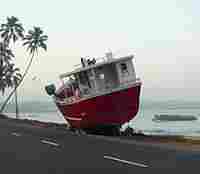 Tsunami-damaged fishing, dive and glass-bottom boats used for coral reef viewing litter a shoreline of broken buildings and uprooted trees along Sri Lanka's southwestern coast at the village of Hikkaduwa. The deadly tsunami sparked by a massive Dec. 26 earthquake off the coast of Sumatra killed nearly 300,000 people and displaced countless more along Indian Ocean shores far removed from the quake's epicenter. Relief efforts have focused on the human tragedy -- but now, scientists are starting to examine the ecological consequences, and the role of natural systems in mitigating damage. In a two-part series of reports for the NPR/National Geographic co-production Radio Expeditions, Elizabeth Arnold journeys to the island nation of Sri Lanka with one of the first teams to assess the environmental aftermath. In many parts of the island directly in the path of the tidal wave, the tsunami looks as though it happened just yesterday. Bits of people's lives are still caught in tree branches and telephone poles -- children's toys, clothes, bedsheets -- and pieces of boats dot a landscape of rubble and concrete skeletons that were once buildings. 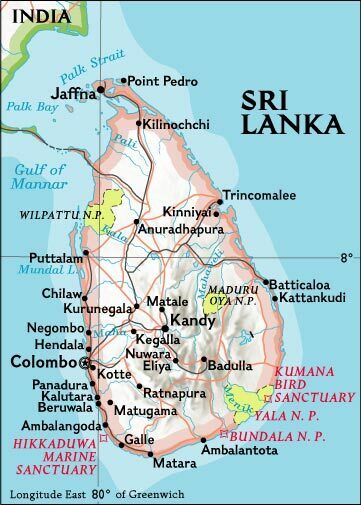 Three workers from The Nature Conservancy have been sent to join the Sri Lanka Wildlife Conservation Society to assess the health of the coral reefs, mangrove swamps and beaches from the western coast all the way around the southern tip of the country to the protected parks in the east. It's an ambitious task, especially in the wake of a disaster of such epic dimensions. Sri Lankan-born Sanjayan Muthulingam, a lead scientist with the conservancy, has wanted to return to his homeland for years to give the island's fledgling conservation movement a boost. Now he and his hastily assembled team have about a week to survey the impact of the tsunami, and to gauge whether natural systems will help to diminish the damage. The team first explored the coral reefs off the shores of Unawatuna, using salvaged diving gear and the only boat that wasn't smashed to pieces. The diving proves difficult -- it's been weeks since the tsunami, but the sediment is still thick and visibility is poor. There is obvious damage to the reefs. But after two days and a dozen more dives along the coast, it becomes clear that most of the damage occurred before the tsunami. Much of the coral was already dead from warm-water bleaching and human activity -- the coral is mined to make concrete, broken off by anchors and tourists, or blasted by explosives from fishermen. 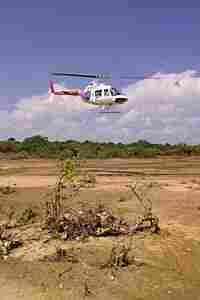 What's more, the mangrove swamps that would have anchored the shore have all but been cleared by development. 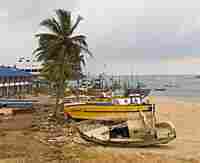 Along the coast in the southernmost tip of Sri Lanka, where tourist hotels give way to stretches of protected coastline, the damage is minimal. Ravi Corea, head of the Sri Lanka Wildlife Conservation Society, says the lesson is obvious. "They're talking about early warning systems and spending billions of dollars for these high-tech gadgets, right? The sand dunes are like a natural barrier -- the lesson is leave natural barriers alone, like mangroves [and] reefs, give them more priority." 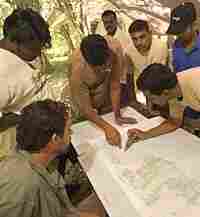 Later, the team makes a "rapid assessment" of Yala National Park -- home to an amazing number of wild animals, including elephants. And again, where nature has been allowed to mitigate the damage of a natural disaster, the wildlife proves to be incredibly resilient. Biologist Pruthu Fernando has studied elephants at Yala for the past 12 years, and believes the tsunami and its effects are part of a natural cycle. A search by helicopter reveals the extent of damage from the tsunami isn't as much as was expected -- especially in "natural" areas where the energy of the wall of water was blocked by sand dunes and trees. In populated areas, the coast just looks smashed. "This is a human disaster," says Tim Boucher, a conservation geographer. "I don't think it's an ecological disaster at all... I may get shot down for saying that." At a meeting with officials to map a strategy for recovery, Muthulingam says that's part of what good expeditions are made of. "You come expecting to do one thing, you learn on the way," he says. "The biggest impact that will ever happen to this park in the next 50 years is not the tsunami -- it will be what is starting to happen in rooms like this."